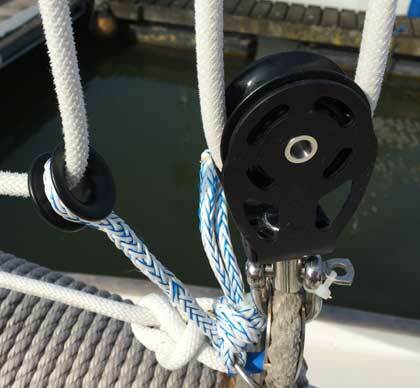 Alternative halyard block arrangement on Mischief. The low friction ring is quite a lot cheaper than a quality block. Nevertheless at my in-harbour-test, it seems to do the job. Another nice bonus of this arrangement is that the total weight is less than half of the original double Barton blocks (was > 500 grams, now 240 grams), all the little bits help. I still have to test the arrangement out on the water and in waves, and will let you know the results. Update: first trials on the river were very good. Light hoist and easy recovery. The sail actually went up slightly higher than with the double blocks, giving just that little bit of extra play for trimming. The torsion on the top block was visibly reduced. We had a very good shake down sail but need to make it easy for short hand sailing ! Any tips greatly received .